- Have a professional check your system periodically. - Keep an eye on the refrigerant level. - Oil the blower motor and fan on both the condensing and the evaporation units annually. - Keep the condensing-unit pan free of bugs, leaves and dirt. - Check the tension on the condensing and evaporation unit blower fan belts each spring. - Inspect the blower ducts and joints for leaks and insulation slippage annually. - Clean or replace air filters in both window (monthly) and central units (quarterly). - Clean window units completely each year. Oil the blower motor and fan. - Check the joint between the window frame and the unit to be sure it is properly caulked and weather-stripped annually. - Keep the blower motor fan blade free of mold and mildew. - Set your a/c fan speed on high except in when it’s humid. - Use a whole-house attic fan. - Don't crank your thermostat as low as it can go when you turn on your air conditioner. - Set the thermostat high as comfortably possible in summer. - Don't put electronic equipment near the thermostat. It senses heat, which causes the a/c to run too long. 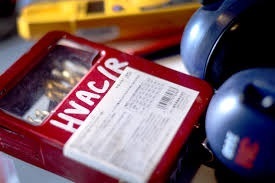 If you need HVAC Service recommendations, give us a call!